The 7 Habits of Highly Dominant People has transformed the lives of many inmates at the Puddville, Alabama Psychiatric Hospital, including men and women who think they are Kings, Queens, Presidents, and the reincarnation of Elvis Presley. In short, dozens of people of all ages and professions have benefited from Ronnie Champ’s wisdom, and now you can too! This book contains an excerpt from Ronnie Champ’s classic self-help parody, How to Win Girlfriends and Dominate People, as well as an exclusive Q & A with author and professional DOMINATOR Ronnie Champ. 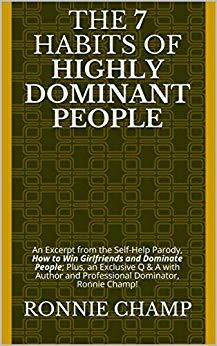 "The 7 Habits of Highly Dominant People (Parody)" by Ronnie Champ was first posted on freebookpromotions.com on April 03rd, 2019. Each day we feature new free and discounted Kindle books in the Humor & Entertainment genre as well as all other genres. Previous Previous post: Time Is Irreverent 2: Jesus Christ, Not Again!